Palm company released (http://www.palm.com/us/products/phones/pre/) the new smartphone managed by GNU Linux based operating system. This product becomes more and more popular due to the cute GUI, well-documented SDK and easy start on the development. But nevertheless many low-level features of this system is poorly documented. This article will be useful for those who start working with the console interface of GNU Linux generally and Palm Web OS in particular. It may be useful also for the developers who need more capabilities than Mojo SDK provides to solve their task. Accessing Linux using “novacom” utility. Basic Linux commands. Installation of additional utilities (sudo, package manager etc.). Configuration of the virtual machine (virtualbox). Installremove packages. 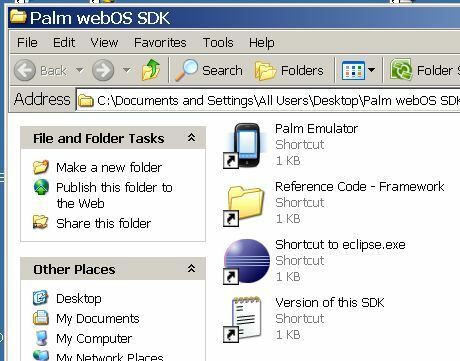 Short description of the system files and directories specific for Palm Pre. Work with FTP on Palm Pre, review of some files content. This article is some kind of review. 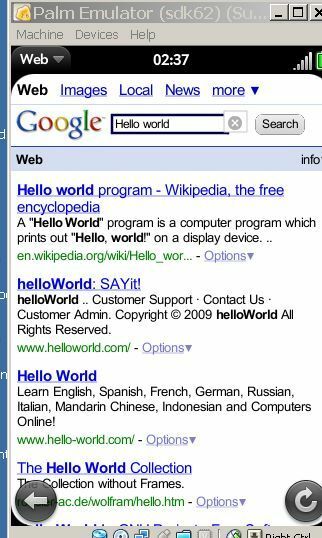 I used emulator from the Palm Mojo SDK package to research the features of Web OS. Choose the platform you need on the download page (Fig.1) and then follow the instuctions on the site and in Install Wizard. It’s better to install Java first, thenVirtualBox, and thenSDK. Such order decrease the possibility of errors. During the installation the virtual machine for Palm Web OS will be created. You don’t have to create it manually. To start work with Web OS Linux start the emulator. You can use either the shortcut created by installation program (fig.2) or VirtualBox interface(fig.3). If verything is ok then you’ll see the Emulator window (fig.4). We’ll need the Internet connection for the further work. It should be configured only in the host system (in our case it’s Windows) . You can check ff there is Internet on Emulator simply starting Web Browser. To do it choose Programs (right bottom icon) => Web. After that try to open some site just like on the computer. Search something for example (fig.5). opens the Linux terminal window. Note: like in the usual Linux, more than one terminal can be opened in Web OS. First lets browse the file system. ls command is used for this. After entering it we see the content of the current directory (root by default). Directories now have / symbol at the end. So as you see we have only three files in the root directory: wget, log.txt, md5sums. When using ls -F some other symbols can occur at the end of the file names. More detailed information about the file system element type can be obtained by means of file utility. This utility is disabled in Palm Web OS by default. Later we’ll consider how to install it. To browse the file content use the command cat <filename>. To obtain the full information about the command enter <command> –help, or search the Internet with keywords “man <command>”. You can also read the help in the full Linux version entering “man <command>”. I propose reader to learn also such commands as rm (remove filesdirectories), mkdir (make directory), touch(create file), cp (copy), pwd (get current path). The process of the program installation for Linux is a bit different from this process in Windows. Unlike other systems Linux has repositories. Repository can be considered as the database that contains program, libraries, and relations between them. There is some special software that manages repositories and install software on the local computer. Such software is called “package manager”. The package manager compares software versions on the computer and in the repository, download software, resolve conflicts between packages. More information about package managers can be found in the articles ,,,. I’ve put the fixed version of this script into the attachments to this article. It lets user to change disk for installation and also is free from the limitations for the emulator. To start the fixed script you shoud get it on the device using the wget command. To organize file exchange with the device you can install ftp server on your computer or other computer in your local network.
) as far as Web OS won’t be able to convert them to the address correctly. Developers and enthusiasts may want to install gcc compiler, gdb debugger, make utility, python interpreter and other great things. The presence of these utilities allows program installation by means of building from the source texts. Let’s start from the folders that are common for all Linux systems. These are folders for standard utilities from Linux package, shared libraries (Windows *.dll analogues) and user files correspondingly. The access points to the external data storages (floppies, hard disks, optical disks) are stored in these directories. In the Palm memory card (micro sd) can be mounted to this directory. And there is nothing interesting there on the emulator. Note: The lost+found directory is specific for the extX (ext1, ext2, ext3, ext4) file systems. Device files are stored here. null – «black hole», eating all information that is entered into it. There are databases used by high-level applications of Web OS. 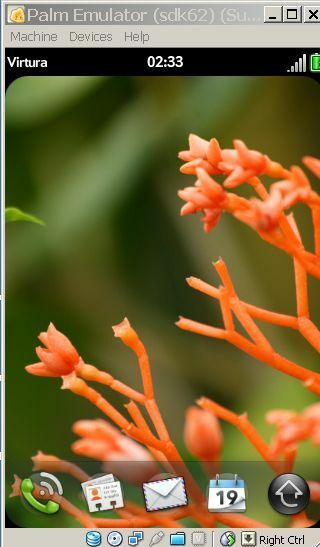 Bases PalmDatabase.db3 and PalmAccountDatabase.db3 is in sqlite format. There are data of such applications as mail accounts, notes, calendar, chat, memo stored in them. We will discuss how to exchange files with Palm Pre in the next section. The data about the locations of images, music, movies etc. are stored here. After analysis I can say that these data are stored in the directories: /media/internal/, /usr/palm/ and their subdirectories. The text of email messages is stored in this directory in html and ascii formats. Here you can find Java services (or, if yo like, deamons). Using them the application developed with the usage of Mojo SDK can get access to the low-level components of the system. Here java library files (*.jar) are stored, they are used by services. Well, now we know what and where is situated. But it’s not very convenient to research file content directly on Palm Pre. So we have a task of getting files from the device. Install FTP server (for example this one http://filezilla-project.org/download.php?type=server ) to the one of the computers in the local network you work in (for example on your own one). 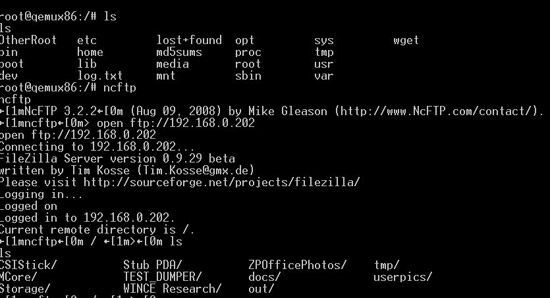 Install the FTP client on your computer. It can be the plugin for Far Manager or Total Commander, or it can be separated application – for example FileZilla ftp client (http://filezilla-project.org/download.php ). Use ncftp to transmit data to the server (it will be described later). Get data from FTP server to your computer. To connect to the server enter ncftp <url>. When the connection is established the current local directory is «frozen». 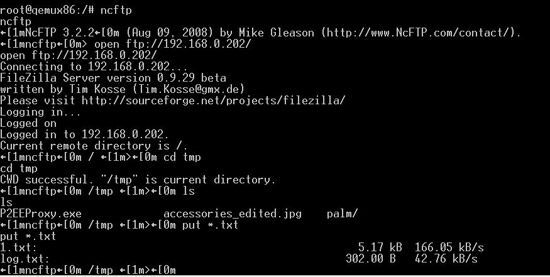 Instead of working with the directory all commands of navigation in the file system are translated in the commands of the FTP and processed by the server. Ncftp also supports such commands as mkdir, rm, rmdir, pwd. The same commands but with l- prefix are used to navigate in the local file system: for example lmkdir, lls, lpwd etc.